By now everyone has heard about energy saving glass. There are constant radio adverts and much hype surrounding this product. The technology for low emissivity or low-e glass was developed in the late 1950’s However it was only in the mid 90’s that it became commercially available with the advent of Pilkington’s K® Glass. Low-e glass is like regular glass but it has an almost invisible coating on it that helps it to keep more heat inside your home. When double glazing is made using low-e glass it prevents heat escaping through your windows by reflecting heat back into your room. It sometimes gives off a slightly different hue but generally speaking does not look any different from standard glass. It does this by utilising an ultra-thin metallic coating on or in the glass. Sunlight contains visible light, UV light, and infrared (IR) light. With visible light we can see things. Ultraviolet light damages your skin, fabrics and wood and it also causes colours to fade. Infrared light is basically heat. Low-e glass has the ability to allow visible light to pass through while blocking certain amounts of UV light and IR light. Of course you should, right??? If you are getting new windows fitted then the answer is 100% YES. You would be mad not to. 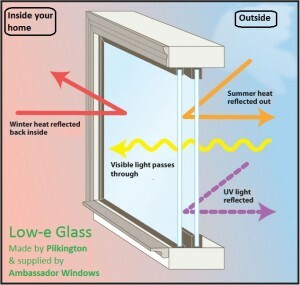 Low-e glass is around 65% more efficient than standard double glazing. It will keep your home more comfortable in winter and reduce the amount condensation on the inside of your windows. If you have existing windows then the decision is more complex. You must compare the savings you will make on your heating bill to the cost of the new glass. This is not a simple or direct comparison. Changing the glass to high energy efficiency low-e glass usually costs less than half the price of new windows. Keeping your existing window frames will also save on any mess, re-plastering and redecorating costs. But if your window frames are in very poor condition or were a poor quality window frame to start with, you might be better to replace the windows altogether. Ambassador Window Repairs will give you honest advice to help guide your decision. 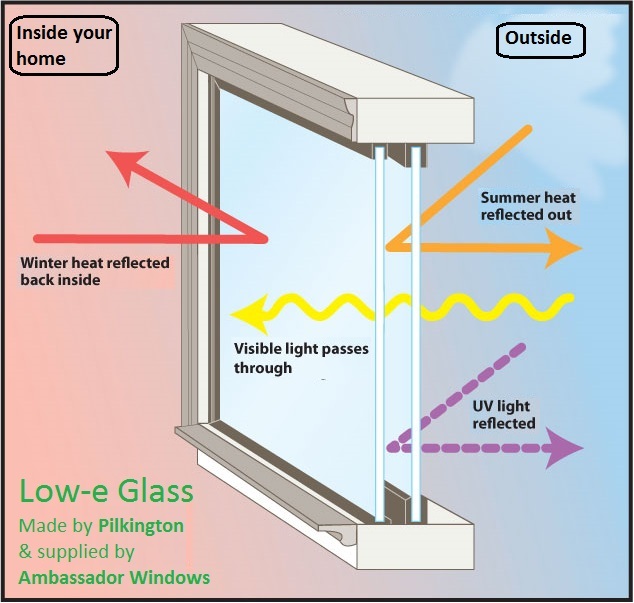 If you decide to replace your existing double glazing with new heat retaining glass from Ambassador Windows, we guarantee you a competitive quote, top quality Pilkington K Glass and a professional service. Before you settle for an expensive quote for one of our competitors, give us a call. We are in business a lot longer than most and have been quietly upgrading people’s windows since the late 1990’s.